My daughter is about to turn seven years old next month (where has the time gone? ), but she has a soft spot in her heart for Vampirina. While she has mostly graduated to Monster High to fill her funny monster needs, I still catch her watching Vampirina every now and then. There's just something enjoyable about this show from Disney Junior that continues to capture my daughter's imagination. The show follows Vampirina, aka Vee, who tries to fit in when her family moves from Transylvania to Pennsylvania to open a local bed and breakfast that caters to the frightful crowd. 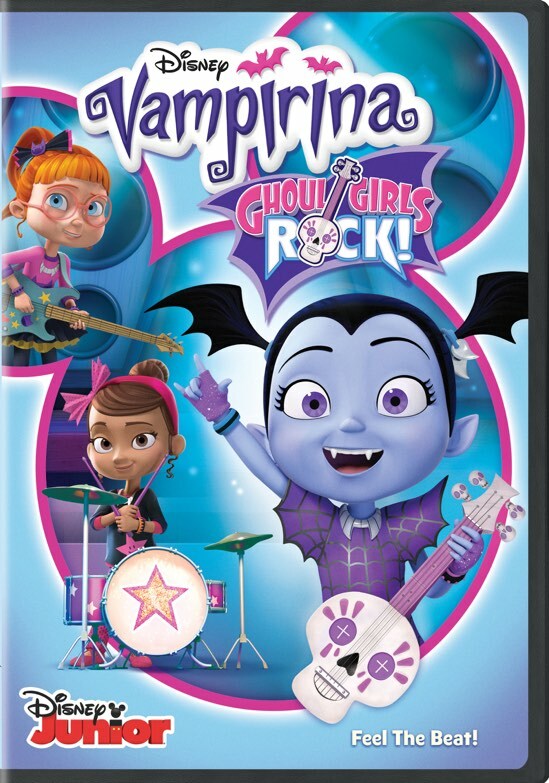 In this most recent compilation of episodes, Vampirina: Ghoul Girls Rock, Vampirina, Poppy and Bridget start a rock band called Ghoul Girls! and travel to Transylvania for their first-ever "Scream Factor Talent Competition." The set includes six 22-minute double episodes and bonus music videos that will almost assuredly keep you rocking for days. I have always had a soft spot in my musical heart for female rock bands and it's something that I have been trying to pass along to my daughter. So far, so good as her current career aspirations include being a teacher by day and rock star by night. Hey, that sounds like the premise of a kooky sitcom, someone in Hollywood, call me. As I mentioned, my daughter is already a fan of Vampirina, so she was ecstatic to relive these episodes that feature the Ghoul Girls. She was singing along and fully embracing her inner Ghoul Girl that she hopes to one day channel into a singing career. She's only seven, so we shall see how her rock star ambitions play out, but it's safe to say that she will still find enjoyment of Vampirina for at least a few more years. This is the second Vampirina DVD offering to date and the episodes are mostly culled from the middle of the first season. New episodes of season one are still being released a year later, so these DVDs offer a great way to bundle the episodes together. The included episodes are listed below. There are also separate music videos that I know from experience will delight any wannabe rock stars out there that want to sing along. Vampirina: Ghoul Girls Rock is another strong entry from the Disney Junior lineup. They are championing this decision to release several smaller offerings as opposed to complete seasons and I think it is working for them. This strategy allows them to focus on grouping the episodes by story arcs and keeps the overall package compact and succinct. The price is also a nice plus as the DVD is available for the suggested retail price of $12.99.